We’ve posted the Kansas City Royals 2018 spring schedule, as the team prepares for another Cactus League training camp at Surprise Stadium and the Surprise Recreation Campus. The club will begin its 16th season in the Cactus League on February 24 vs. the Los Angeles Dodgers at Surprise Stadium. Kansas City’s schedule features 16 home games at Surprise Stadium and one game as the visiting team on March 17 as part of a split-doubleheader with Texas. The Royals will also host both ends of a split-doubleheader on March 12 vs. San Diego and Texas. The Royals will travel to Werner Park in Omaha, Neb. on March 26 to complete their exhibition schedule with a 6:05 p.m. CT game vs. their Triple-A affiliate Omaha Storm Chasers. This will be Kansas City’s first exhibition game vs. Omaha since 2000, when the franchise was known as the “Golden Spikes.” The Royals will open the regular season at Kauffman Stadium on March 29 vs. the Chicago White Sox. 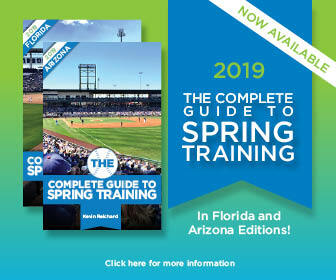 Individual spring training game tickets go on sale via an online pre-sale on Saturday, December 9 through www.surprisespringtraining.com and tickets.com. The Surprise Recreation Campus will accept mail orders as well as online orders. The Surprise Recreation Campus Box Office will open on Saturday, January 6 for walk-up purchases. Pitchers and catchers will report to Surprise on Tuesday, February 13. Workouts for pitchers begin the following day, Wednesday, February 14. The remainder of the squad will report on Sunday, February 18 and begin workouts for the 2017 campaign on Monday, February 19.